Bill Nye the Science Guy gave a commencement speech at Rutgers on Sunday. Reading the speech left me thinking that if this is America’s designated Science Guy, I can be the nation’s designated swimsuit model. 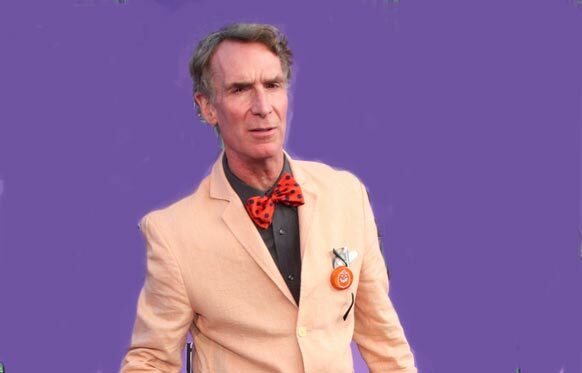 Up to now I have had only the slightest, vaguest awareness of Bill Nye. Readers have occasionally pointed me to video clips of him in one context or another, but none made a lasting impression. What mainly registers is the bow tie, which stirs in my breast a faint, fleeting flicker of tribal solidarity: I wear bow ties, too. Googling around I see that Nye got his epithet from the title of a TV show he hosted in the 1990s. The show was targeted at a preteen audience, aiming to show them that Science Is Fun! Is it? Should it be? My ideal for science education would be for those who want it to prove their ardor by being kept waiting outside the monastery gates for a month, suffering stoically in rain and sleet while those inside jeer at them and dump ordure on their heads from the ramparts … I speak as an enthusiast, a science geek from infancy. We”re going to find a means to enable poor people to advance in their societies in countries around the world. Otherwise, the imbalance of wealth will lead to conflict and inefficiency in energy production, which will lead to more carbon pollution and a no-way-out overheated globe. Uh, given that advanced countries use far more energy per capita than backward ones”the U.S.A. figure is thirty-four times Bangladesh’s”wouldn”t a better strategy be to keep poor countries poor? We could, for example, encourage all their smartest and most entrepreneurial people to emigrate to the First World … Oh, wait: we already do that. If we did do anything the effect would likely be puny compared to, say, a single major volcanic eruption. Mother Nature laughs at our climate change fretting. Consider ice ages for example, like the one we are currently living through. Ice ages last for tens of millions of years. We don”t know how many there have been. Our planet is 4½ billion years old; we only have clear evidence of ice ages for the last billion years, in which time there have been four ice ages, covering a total of one-third of a billion years. In its “normal” condition”the other two-thirds”the Earth is ice-free all the way up to the poles. The present ice age started around 2½ million years ago. Our best guess is that it”ll continue for several million years more. The climatic changes here are sensational. At the peak of the last glaciation in 20,000 B.C., the pleasant suburb where I am writing this was buried under an ice sheet several hundred feet thick. It is possible that during one of the earlier ice ages, 700 million years ago, the entire planet was covered with ice, down to the equator.